The goblin who lives in the Court of Sciences could not be reached for comment. 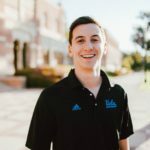 WESTWOOD—Sources confirmed last Tuesday that the infamous troll of Bruin Walk, Jiles Grumpus, has run out of riddles and begun asking students if they are interested in a cappella. Grumpus has been a Bruin Walk icon for many years, most notably for his trademarked technique, the “Stop-and-Stump™,” in which he stops a student on their way to class and “stumps them with a top-notch riddle.” If the students are unable to solve the riddle, they will then be forced to pay a small toll. However, Grumpus’ technique has drastically changed in the last few weeks. Rather than providing a “nice, tricky riddle,” Grumpus has taken to asking his detained students if they are interested in joining an acoustic performing group. Several students have since been able to traverse all of Bruin Walk without paying any kind of toll. At press time, Grumpus was found complaining about how dwindling tolls are wreaking havoc on the troll economy.